Double-decker bus tilt testing. April, 1933. London. For those who have visited London and wondered how they know their double-decker buses won’t fall over, this is apparently how they find out. 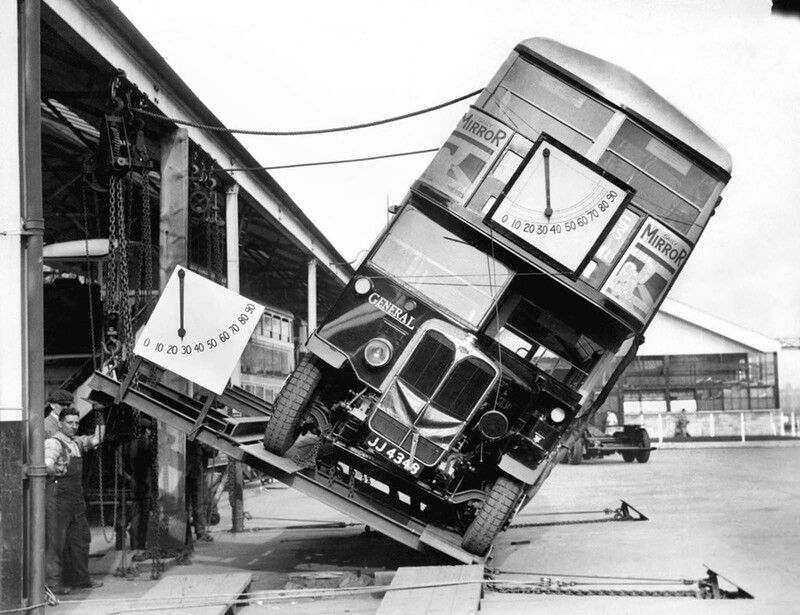 Per police regulation, employees of the London General Omnibus Company put their 60-person bus to a “tilt test”. The test was considered passed if the double-decker buses would tilt 28 degrees without tipping. There are sand bags in the upper deck to simulate 60 passengers. Note the chains and the slight lip, those are not preventing the vehicle from tipping. The lip is to prevent the vehicle sliding laterally down the ramp. The chains (straps nowadays) are slightly loose and stop the vehicle rolling as the brakes have to be off during the test. They will also catch the vehicle if it does tip, the test is to find if the point of tipping is less than the required limits, they don’t need to completely roll the vehicle to find that out. That would be a pretty expensive method. Here’s a short clip documenting the bus tilt testing. The first engine-powered double-decker bus appeared in London in 1923. At this time, there were a shortage of buses in London and various companies competed against each other for bus dominance. By 1924 there were over 200 independent buses operating in the city, running along popular routes. Such independent buses were known as “pirate buses” (though, sadly, they lacked peg-legged men with eye patches). Not shackled to an official route, pirate buses would sometimes take side streets and alternative routes to get to destinations faster. It was because of the competing bus companies that London General Omnibus Company—the biggest operator in the city—painted their buses red to stand out from the competition. The Metropolitan Police approved of the red buses; the colour was so easy to spot acting as a warning to those crossing the street. The red double-decker buses in London would become a national symbol of England and United Kingdom.